I don't know what it's like where you are, but the summer that everyone was lamenting would never arrive is definitely here. As evidenced by my melting self as I sat outside for a meeting at 1pm, overheating in my black pants and thin plaid shirt. Yes, I need to wear a skirt tomorrow. I'd been doing so well dressing for the weather but today's outfit was a total and utter fail. I love how the style offsets the pure geekiness of the pattern. Hubby says he doesn't see me wearing anything like this but I think it's just too. much. fun. What about you? Would you have the guts? 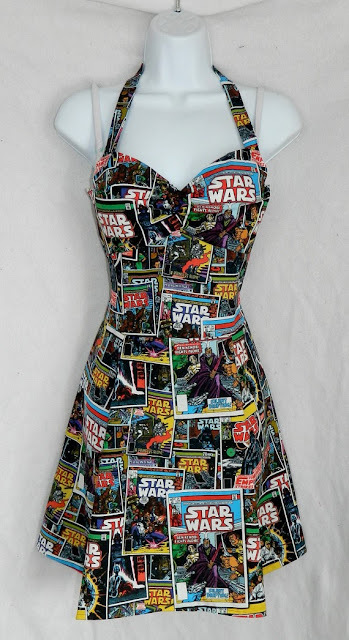 Or guys, would you see your nerd girl in something like this? Made on demand by Candied Starfish.